Does Corn have an expiry date? Many of us would not drink milk past the expiry date, maybe on a dare but even then many of you are probably a little uneasy with just the thought of this. As corn harvest is slowed down due to weather or full elevators I get that same uneasy feeling I get thinking of drinking spoiled milk. In 2010 we planted our corn early and had great heat and rains throughout the summer in much of the corn producing areas of Ontario and Quebec and yet we are somewhat surprised that the standability is starting to weaken. 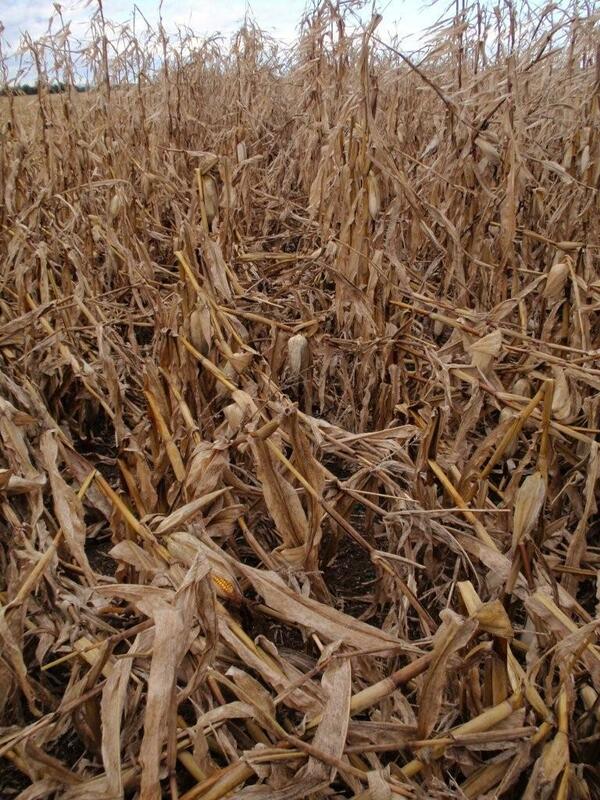 Could it be that we have went past the expiry date on corn stalks and roots? I would say yes. Current moisture levels are below 20% and the corn was fully mature (black layer) over a month ago, so the plant has been dead for a while. Dead plant material rots. If you add moisture (heavy dews, frequent rains even frost) it rots faster, plain and simple. Add high winds and rotting stalks break. One of the main differences I see in traveling from a Western corn area (mid west US) to an Eastern corn area is the higher level of moisture and therefore rot organisms that the corn plant must survive. In the East our expiry date is less than the West. Also, how the plants partitions its energy resources (sugars) – yield or plant health affects the expiry date of corn. If every plant only has one 2 gallon pail of energy to use where is it going to use it (ex. 1/2 gallon for stalks, 1/2 gallon for roots and 1 gallon for grain) each hybrid is different on how it partitions its 2 gallon bucket. Generally, the very high yielding genetics put more of its bucket into grain and the stalks and roots may run out as we go later into the season (shorter expiry date). Average yield with consistent standability may use more of its 2 gallon bucket for stalks and roots and therefore stand longer but yield less (long expiry date). So what do I do as a grower? Harvest your short expiry date hybrids early to maximize the yield of those hybrids. This fall select a portfolio corn genetics that have long and short expiry dates.